A Median Auction Maiden Stakes over 1m on Standard going. Eight three-year-olds take part: five with race experience, three debutantes. Colts against a trio of fillies. David Simcock's Ahead Of Time catches the eye. This bay colt is a son of Dream Ahead out of an unraced mare. He is owned by Khalifa Dasmal who is no stranger to top-class horses including the outstanding sire Dream Ahead [pictured]. Readers may remember Shaamit who won the 1996 Epsom Derby for William Haggas. Ahead Of Time cost 115,000G when purchased by Mark Crossman at the yearling sales [43,000G, foal]. This February foal hasn't been seen on a racecourse for two hundred and fifty-four days when making his debut at Kempton over 6f. Starting 5/2 second-favourite, in a small field, he challenged the runner-up but finish third behind easy winner Morning Suit. This step up to one mile shouldn't be a problem, although you have to trust he is fit and ready to run after such a long absence. It is likely connections are satisfied with proceedings. From a statistical angle, this horse has strong win and place claims. Even at these odds [15/8] there could be value. If drifting in the betting to an each-way price that would be a bonus. Sir Mark Prescott's Alabaster is worthy of note. This grey son of Archipenko cost 100,000G when purchased at the yearling sales. He is a fairly expensive horse to race at this class and clearly one of the better offspring from this sire. Alabaster was relatively fancied on debut which adds to the impression this colt has some ability. Most of Prescott's debutantes are hated in the betting and desperately in need of the race. It was a respectable first start. This April foal should be primed to go well. Definitely a horse with fair each-way claims if priced 13/2 & less SP. The Cheveley Park Stud owner-bred daughter of Holy Roman Emperor wasn't best fancied when making her debut for William Haggas in January, finishing seventh. Faience started slowly and was never competitive at any stage. 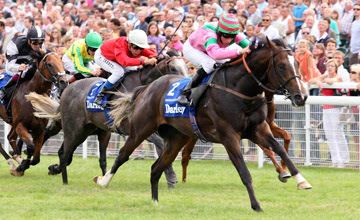 The mare won three times when trained by Jeremy Noseda for the same connections. Has something to prove, but worth keeping an eye on the betting just in case she is well backed. If priced 13/2 & less SP this bay could figure. Dubai Waves is a homebred for Rabbah Racing, trained by Hugo Palmer. The mare raced for Goldolphin although limited. Homebreds can be a little slower to come to hand. However, the betting is the best clue. If priced 13/2 & less SP has sound each-way claims but if weak in the market I would take a watching brief. Mark Johnston field Specialist who is a debutante and son of Mastercraftsman. This bay colt cost 26,000E at the yearling sales. I often find Johnston's debutantes difficult to assess. The shorter the price the better the chance. If weak in the market best watched. Charles Hills has the twice-raced Traveller. This bay colt is a son of Henrythenavigator and cost 60,000E when purchased at two. He showed an element of ability on debut when 20/1. He showed more next start when stepping up to one mile although the second had an official rating of just 72. *Melo Magic raced two hundred days ago and finished last. Indian Red is best watched. Conclusion: In many respects, this could revolve around Ahead Of Time & Alabaster. Both trainers are noteworthy. There was money for both of these colts on debut and they come from trainers who know how to prime their horses' second start. David Simcock's charge has decent win and place claims. If you can get a halfway decent price for a place on the exchanges, it could be the safest bet. I'd cross my fingers that money comes for one of the others. If available at each-way prices, it would be a good bet. Alabaster should be feared. If very weak in the market, drifting outside 13/2 & less SP, I would take that as a negative. However, if fancied, could put down a challenge and hold decent each-way claims. Faience doesn't look fancied but another to take note if seriously backed.